I’m looking for some more quick Halloween themed projects you still have time to do. 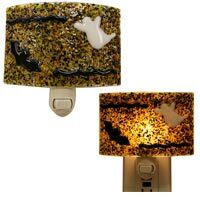 This is a fused glass night light from Jubilee Creative. It uses mostly frit and some pre cut pieces such as the bat and the ghost. If you can’t get those pieces you can always improvise. This is a beginner project but of course any level can play and make it their own.